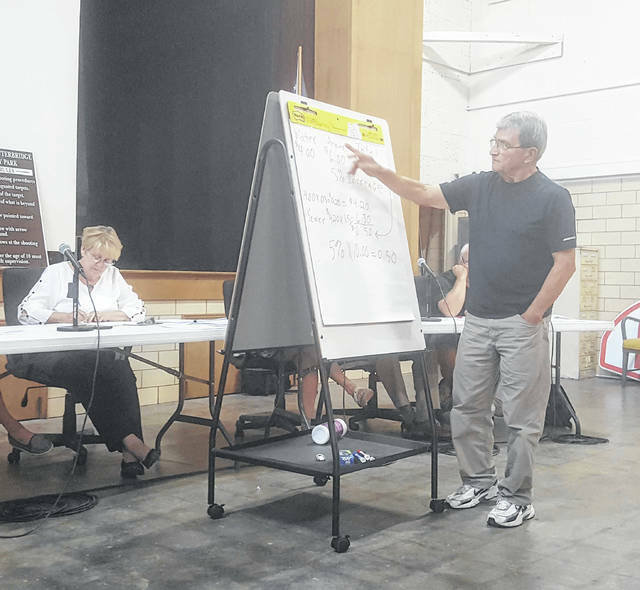 MIDDLEPORT — Middleport Village Council will seek the assistance of RCAP regarding a potential increase to the water rate which has been debated for several weeks. During discussion of the water rates at this week’s council meeting, Councilman Emerson Heighton presented information to compare water and sewer rates in Middleport to those of Pomeroy, as well as show what a four percent increase would be to residents. In Middleport, the minimum water bill is currently $18.83, with a sewer bill of $28.85, for the minimum usage of 2,000 gallons. In comparison, figures shown by Heighton list Pomeroy’s minimum water bill at $43.74, with a sewer bill of $32.92 for the same 2,000 gallon usage. Heighton stated that the residents of Middleport, for a minimum bill, are currently paying $29.58 less per month. Heighton, using a figure of 2,800 water usage, showed what the difference in the bill would be. Currently, a bill for 2,800 gallons is $70.00. A four percent increase would bring the bill to $72.80. Regarding the water rates, Councilman Brian Conde provided information regarding recent increases in other villages and cities, some in excess of 15 percent. “We are not the only village facing hardship,” said Conde, noting that the village must remain financially responsible and complaint with standards. Councilman Ben Reed, who was appointed to the seat earlier in July, asked Fiscal Officer Sue Baker what the specific goal is with the raising of the water rate to better understand the village’s position. Baker explained the village is not keeping up with the inflationary increases of goods and services for the operation of the water and sewer system. The goal is to catch up and bring in more than the village is spending, said Baker. Councilwoman Sharon Older questioned payroll costs for the water and sewer department, regarding the need for the rate increase. Older previously asked Baker for all village financial records and will review those to see if there are ways to avoid the increase. Older is to present on her findings at a future meeting. Baker explained the public works payroll is actually less than it had been previously, while the increased expense is with the goods and services such as AEP electric and required testing materials. Baker suggested the village ask RCAP for assistance as the water rate increase continues to be discussed with various numbers being tossed around, but no definitive figures. While the increases of 4, 5 and 9 percent have been discussed, RCAP can provide the village with the number to best meet its needs, while also outlining a plan to move forward in the future. RCAP, the Rural Community Assistance Partnership, is a national network of non-profit organizations working to provide technical assistance, training, resources, and support to rural communities across the United States, tribal lands, and U.S. territories. Ohio is part of The Great Lakes RCAP. The agency assists communities with populations under 10,000 in the development and management of water and wastewater facilities. Baker estimated the cost for the rate study at $3,000 to $4,000. Council unanimously voted to contact RCAP for assistance. After that decision, Heighton made a motion to go ahead with a four percent water, stating that it would give a start to the increase, with RCAP’s recommendation likely to be higher than that figure. The motion by Heighton did not receive a second, and therefore was not voted on by council. Additional information from the Middleport Village Council meeting will appear in an upcoming edition of The Daily Sentinel.